We’ve seen various renders and other images of the upcoming Pixel 3 XL, and now we've seen on more photo of it in the flesh – and it doesn’t make the best first impression. Shared by a reader of MobileSyrup, the photo was apparently taken on a streetcar in Toronto, and it shows a phone with an enormous notch, by which we don’t just mean a wide notch, but one which sticks out into the screen more than we’ve been used to seeing. This doesn’t come as a complete surprise, as the notch looks similarly large in renders we've seen, but it’s a lot more noticeable in this real-world shot. 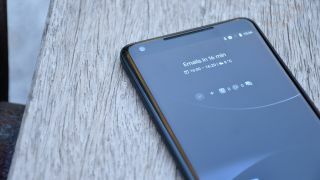 A notch this size also means that if you choose to hide it (by blacking out the screen to either side) the Pixel 3 XL will effectively have a massive bezel. There’s not much else to take from the image, but you’ll note that there’s also a bezel below the screen, housing a speaker. While we can’t be certain that this is the Pixel 3 XL (especially since much of it is obscured by a case) it does seem to match up with leaked renders, and you can just about make out Android Pie’s gesture navigation at the bottom of the screen, which the Pixel 3 XL is sure to feature. However, we’d still take this with a pinch of salt, especially since – as 9to5Google notes – the battery icon doesn’t appear to be in its normal Android position. It’s also worth noting that, of the two main rumored Pixel 3 XL screen sizes, we’re probably looking at a 6.2-inch version rather than a 6.7-inch one, given the phone’s size relative to its user’s hands. That makes sense, as 6.7 inches always sounded a bit big to be true. We should know everything for certain soon though, as the Pixel 3 XL will probably land in early October, alongside the standard Pixel 3.